Celestial mechanics is the study of the orbits of celestial bodies, such as planets, satellites, comets, asteroids and spacecraft. We begin with a few definitions of terms. Inferior planets: Those which lie closer to the Sun than the Earth ( Mercury and Venus). Superior planets: Those which lie further from the Sun than the Earth ( Mars, Jupiter, Saturn, Uranus, Neptune and Pluto). 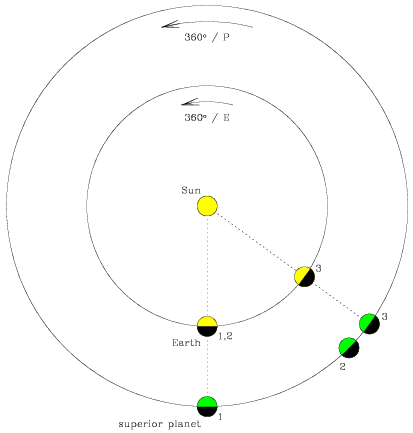 Elongation: The angle observed from the Earth between the direction to the Sun and the direction to a planet. A planet can be at an eastern or western elongation, depending on whether the planet lies to the east or west of the Sun as seen from the Earth. The elongation of a superior planet can vary from 0° to 180°. Inferior planets, however, range between 0° and a greatest elongation (28° for Mercury and 48° for Venus). Conjunction: An elongation of 0° (co-linear with the Earth and the Sun). An inferior conjunction occurs when the planet lies between the Earth and the Sun. A superior conjunction occurs when the planet lies on the opposite side of the Sun to the Earth. Only inferior planets can be at inferior conjunction. Quadrature: An elongation of 90°. A planet can be at either eastern or western quadrature, depending on whether the planet lies to the east or the west of the Sun when viewed from the Earth. 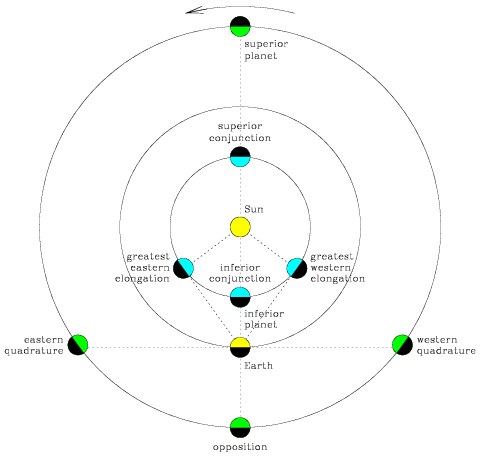 Inferior planets can never be at quadrature. Opposition: An elongation of 180° (co-linear with the Earth and the Sun). At opposition, a planet lies on the observer's meridian at apparent midnight. Inferior planets can never be at opposition. The planets all shine by reflected sunlight, and so half of a planet is always sunlit while the other half is dark. The fraction of the sunlit hemisphere seen from the Earth, however, varies with the planetary configuration. Because of this, the variety of phases exhibited by superior planets differ markedly from those of the inferior planets. The new phase occurs when we see only the dark hemisphere. This can only occur at inferior conjunction and so can never be seen on the superior planets. Full phase, when the entire sunlit hemisphere of a planet is visible, occurs when a planet is in opposition and so can only ever be observed on a superior planet (the inferior planets at superior conjunction also show a full phase, but this is lost in the glare of the Sun). The superior planets can never be observed in crescent phase, when less than half of the observable hemisphere is sunlit, whereas inferior planets can. Superior planets are almost always observed in gibbous phase, when more than half of the planet appears sunlit. Inferior planets also exhibit gibbous phases. The farther a planet lies from the Sun, the slower it moves around the Sun. 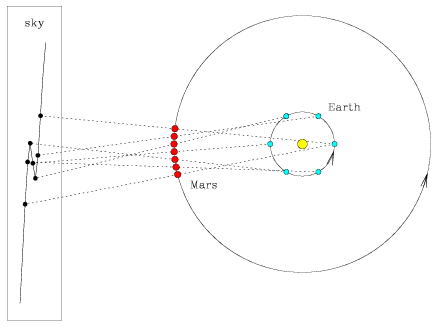 When the Earth and another planet pass each other on the same side of the Sun, the planet appears to retrace its path for a short while (retrograde motion) and then continue in its original direction (prograde motion). As we view the planet from the moving Earth, our line of sight reverses the apparent motion of the planet twice. When the orbits of the Earth and the planet are not co-planar, the motion of the planet in the sky appears as a loop. 1/S = 1/E - 1/P (superior). It is now a simple matter to time how long it takes to see, for example, two successive oppositions of a (superior) planet, S, and to determine the length of the year, P, on any planet in the solar system.